If you head to the produce aisle of your favorite grocery store, you’ll notice a whole refrigerated section dedicated to different greens. 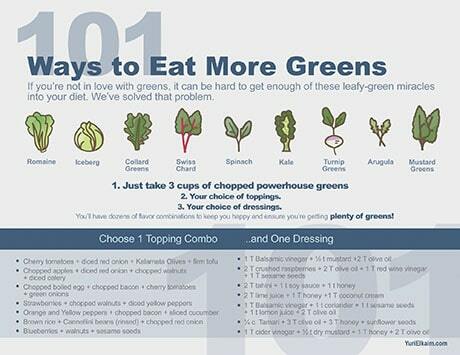 You probably choose the same one or two greens every time out of habit. What you may not know is that the greens you regularly eat may not be one of the highest ranked greens on the nutrient density scale. The nutrient density list, created by Dr. Jennifer Noia of William Patterson University, created the ranking by starting with a list of potential produce powerhouses. The initial list was based on scientific studies which identified leafy greens, yellow/orange vegetables, citrus fruits and cruciferous vegetable as the whole foods most commonly associated with reduced chronic disease. Berries and allium (onions, garlic, etc) veggie intake have also been linked to a reduced risk for cardiovascular and neurodegenerative disease, and even some cancers. So, Dr. Noia began with the known benefits of these real foods, listing them on scale from 1 to 100, based on the percentage of 17 top recommended nutrients (like iron, vitamin C, fiber, zinc and folate) per 100 grams. Noia rated 47 fruits or vegetables, capping each nutrient at 100, so that no one nutrient would outweigh others. This means that a food exceptionally high in one nutrient but lacking in many others wouldn’t be classified as nutrient-dense. The result is an exhaustive list of high-nutrition foods worth focussing on. On this lists of 47 foods, it’s not a surprise that the top 7 are actually leafy greens. The finest source of high-nutrition, alkalizing food in the world, leafy greens should make up a massive portion of your daily diet. I tend to say 80% of your daily diet should ideally be raw. If 60% of your daily intake is raw or lightly steamed leafy greens, you’ll be doing body good, dramatically lowering your risk of chronic disease, and giving your gut what it needs to keep brain and body strong. Discover How and Why You Want to Eat An Alkaline Diet. 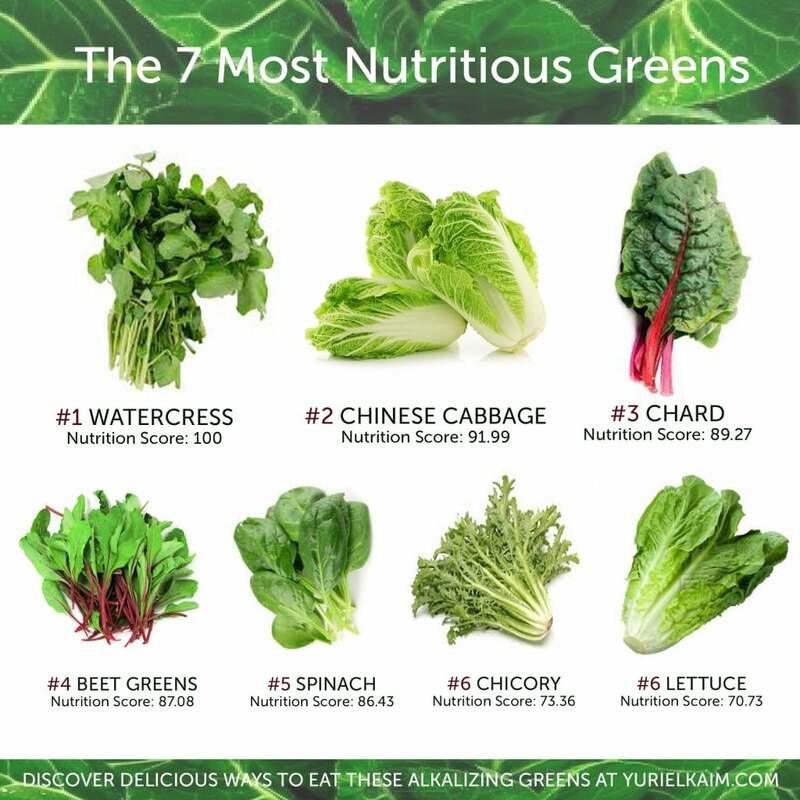 As common as it is to lump all greens in one nutritional category, there are incredible differences between members of this nutrient rich food group. In fact, you may be suprised to discover that those plates of much-adored kale, actually rank 15th on Noia’s scale. With a nutrient density score of 49.07, kale actually ranks below romaine lettuce with a density score of 63.48! Vitamins and Minerals: Vitamins A, C, B, K, E, calcium, iron, magnesium, manganese, potassium, phosphorus, fiber. Watercress is in the cruciferous veggie family, a family well-known for its cancer-fighting properties. This green is grown in natural spring water, and has high levels of nitrates, which have been shown to lower blood pressure. The alpha-lipoic acid in watercress lowers glucose levels, which is a plus for those who are diabetic or pre-diabetic. This amazing green also has high levels of the vitamins C, K, and A, which prevent oxidative stress while keeping your skin glowing and your bones healthy. How to Make: Simply rinse the watercress under cool running water and use a knife to cut off any oversized stems. Blot dry with paper towels or spin dry in a salad spinner. 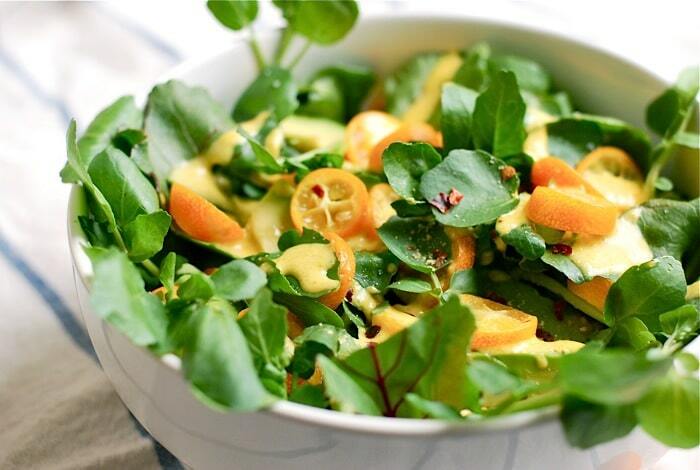 Dress the watercress with a citrusy kumquat garlic dressing like this one from BROOKLYN SUPPER. Chinese cabbage stats: nutrient density score of 91.99, 9 calories per cup, vitamins A, C, B, K, calcium, iron, magnesium, manganese, potassium, phosphorus, zinc, fiber. Chinese cabbage contains high levels of vitamin K, alpha-linoleic acid, and omega-3 fatty acid, which work to lower your risk of chronic inflammation. Chronic inflammation is what causes age-related diseases, and we can avoid these diseases by controlling what we put in our bodies. Chinese cabbage has also been linked to regulated blood sugar levels, eye health, weight loss support, glowing skin, and boosted immunity. This powerhouse greens is absolutely worth adding to your diet every week. How to Make: Discard any damaged outer leaves from your Chinese cabbage. Rinse under cool running water and pat the leaves dry. Lay the Chinese cabbage on a cutting board and slice in quarter-inch rounds from the top of the cabbage to the stem at the bottom. 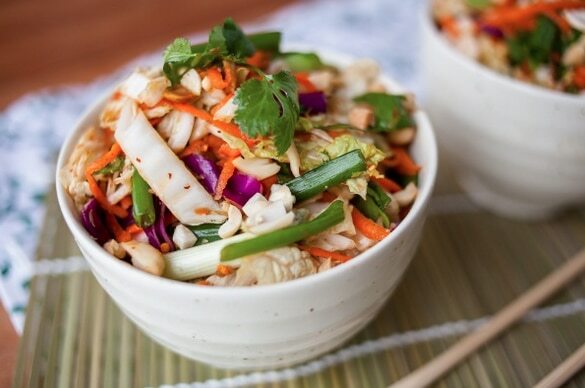 Try Chinese cabbage in a delicious Asian salad with spicy peanut sauce from TRANS-PLANTED. Chard stats: nutrient density score of 89.27, 7 calories per cup, vitamins A, C, B, K, E, calcium, iron, magnesium, manganese, potassium, phosphorus, zinc, choline, copper, selenium, fiber. Chard contains very powerful antioxidants that have cardio-protective and blood sugar regulating effects. The alpha-lipoic acid in chard helps to manage diabetes by lowering glucose levels and increasing insulin sensitivity. Chard is high in nitrates, helping to lower blood pressure and improve muscle oxygenation. The pigments in the leaves of chard provide antioxidant, anti-inflammatory, and detoxification support. How to Make: Rinse your Swiss chard leaves well and pat dry. Stack several leaves on a cutting board and use a knife to cut off the thick center stems. Repeat until all center stems are removed. Next, stack several de-stemmed leaves, fold in half, and cut into ribbons. Now you’ve got ready-to-eat chard! 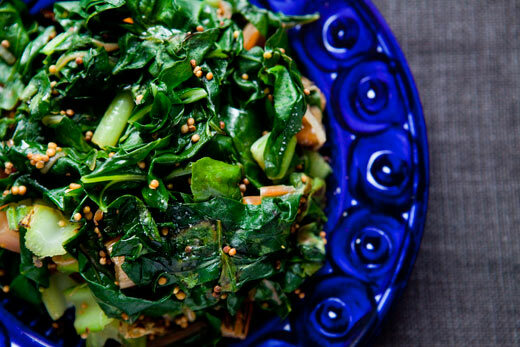 Try this delicious recipe from SIMPLY RECIPES for Swiss chard sautéed with mustard greens. Beet green stats: nutrient density score of 87.08, 10 calories per cup, vitamins A, C, K, B, iron, calcium, copper, phosphorus, magnesium, manganese, selenium, zinc. Beet greens are a good source of iron, which is essential for oxygen transport in the blood, and in myoglobin in our muscles. Iron deficiency causes fatigue, and eating beet greens is a good way to increase your iron levels, resulting in more energy. Beet greens are rich in carotenoids, which protect against age-related macular degeneration, and support eye health in general. How to Make: Prepare beet greens as you would Swiss chard. 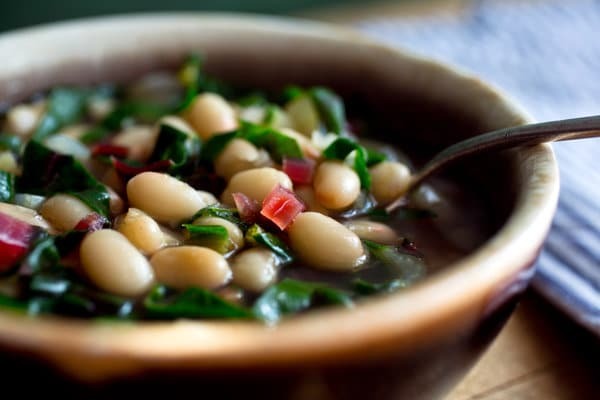 Beets greens work well in soup, and this white bean with beet greens and parmesan soup from NY TIMES is a great way to take advantage of these healthy and delicious greens. Spinach stats: nutrient density score of 86.43, 7 calories per cup, vitamins K, A, B, E, C, manganese, folate, magnesium, iron, copper, calcium, potassium, fiber, phosphorus, zinc, choline, selenium. Spinach is one of the richest sources of iron among the leafy greens. Low iron levels can make you feel tired and sluggish, so eating spinach often will help raise your iron levels. Spinach is also packed with powerful antioxidants and vitamins. Spinach is high in vitamin K, which protects your bones, and also high in vitamin C, which boosts your immunity and gives your skin a healthy glow. How to Make: Spinach is a delicate green, one that shouldn’t be overcooked. Spinach is wonderful in its raw form in salads and smoothies. If adding to a cooked recipe, wait until the last few minutes of cooking to add the spinach so it isn’t mushy and overcooked. Most bagged spinach comes pre-rinsed, and there’s no need to de-stem it. If purchasing spinach in a bunch from the farmer’s marker, it will need to be rinsed and spun dry in a salad spinner. 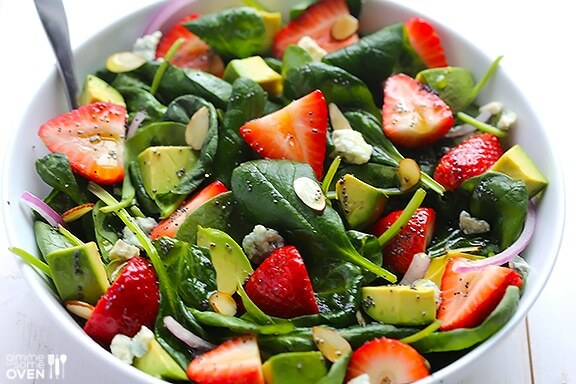 Try fresh spinach in this avocado strawberry spinach salad from GIMME SOME OVEN. Chicory stats: nutrient density score of 73.36, 7 calories per cup, vitamins K, A, C, B, E, calcium, copper, iron, manganese, choline, magnesium, phosphorus, potassium, selenium, zinc. Chicory is in the Sunflower family, and is a close relative to the red-leafed radicchio. Chicory root has many medicinal uses, and is used to calm nerves, detoxify the liver, and aid in digestion. The leaves have many health benefits, including fighting cancer, reducing inflammation, and lowering bad cholesterol. How to Make: Discard any damaged outer leaves from your chicory. Rinse under cool running water and pat the leaves dry. Chicory is great on the grill, and the small bunches of chicory should be left intact or halved for best results. 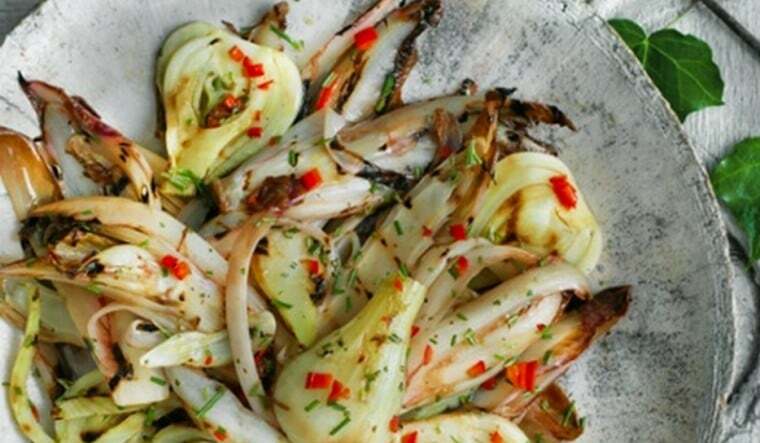 Try this grilled fennel and chicory salad from ANNA JONES that would be perfect with grilled fish. Leaf lettuce stats: nutrient density score of 70.73, 5 calories per cup, vitamins K, C, A, B, iron, calcium, magnesium, fiber. Leaf lettuce is a good source of vitamin A, which is essential for healthy vision. The vitamin C in leaf lettuce protects against the free radicals that cause inflammation and result in chronic diseases. Vitamin C also synthesizes collagen and stimulates the immune system. Another health bonus from leaf lettuce is that the soluble fiber reduces bad cholesterol. How to Make: Cut off the base of the lettuce, and place whole leaves in a cool water bath. A large, clean bowl works well for this. Soak leaves for a few minutes so the dirt falls to the bottom of the bowl and the leaves float to the top. Collect the leaves and pat dry or spin dry in a salad spinner. Stack the leaves on a cutting board and use a knife to cut into bite sized pieces. 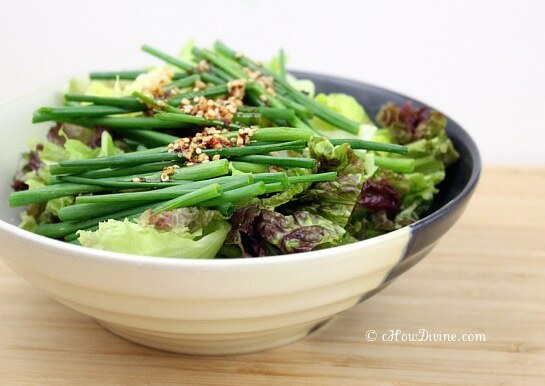 Fresh green leaf lettuce works well in this Korean lettuce salad from CHOW DIVINE. 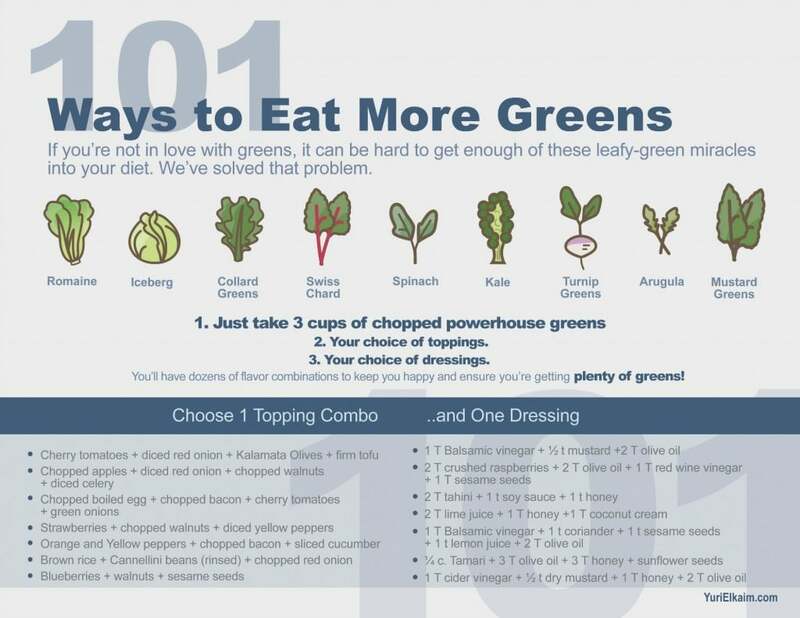 Grab my free 1-page fridge guide that will show you 101+ ways to eat these Top 7 greens. It's FREE! Just tell me where to send it.